« What was left off the menu at the WSJ Global Food Forum? During our visit to Shield Ranch, we saw dozens of monarchs and other butterflies, as an unusually high amount of rain in August sparked a profusion of fall wildflowers in central Texas. With targeted conservation funding through the Monarch Butterfly Habitat Exchange, we can make rapid progress on the ground. In contrast to targeting relatively fewer and larger ranchland sites across the southern Great Plains, the Midwest offers the most habitat potential on a lot of relatively smaller acreages, such as marginal crop lands, roadsides and field edges. The ranchlands of the southern Great Plains provide important breeding and foraging habitat for monarchs in both the spring, when they are heading northward, and fall, during their trip back south. The sheer vastness of these ranchlands offers economies of scale for monarch conservation that are most likely not attainable in other geographies, making the potential return on conservation investment huge. Ranches in this region can be many thousands of acres in size, including Shield Ranch. This offers great potential for a few conservation actions, such as supplemental seeding or prescribed burning, to create significant habitat benefits across large acreages in a relatively short period of time. The result? A relatively quick increase in quantity and quality of habitat for the monarch, which so desperately needs it. Dr. Karen Oberhauser of the University of Minnesota’s Monarch Lab examines milkweed stems on a Minnesota farm. Unfortunately, milkweed, like any weed, has a reputation of being a nuisance for farmers and ranchers. “I like butterflies as much as the next guy, but after spending many hot summer hours as a teenager in my dad’s soybean fields pulling out those sticky, stinky weeds, I still consider them the enemy of any good farmer,” wrote Lloyd Kaufman in a letter to the editor in The Des Moines Register. Many producers share this sentiment. And what’s worse for ranchers is the fear that their cattle will experience milkweed poisoning, since parts of the plant are toxic to animals. But most cases of milkweed poisoning of cattle occur in areas that are overgrazed or where cattle are concentrated around milkweed-infested corrals, bed grounds and driveways. “They only eat the milkweed if there’s nothing else left to eat,” said Paul Kenny, a Nebraska farmer who produces corn, soybean and cattle, among other things. Paul is among a growing number of farmers and ranchers who have become more comfortable with milkweed on their property, from field edges to ranchlands. 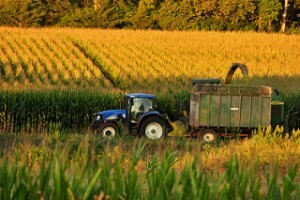 That is, in part, because milkweeds are no longer problematic for crop yields, since pesticides are so effective at eradicating them within fields and reducing the risk of encroachment. With more information and adjustments to management practices, more farmers can turn milkweed from a nuisance into an opportunity. 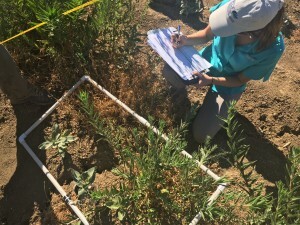 EDF experts assess the quality of milkweed habitat within a transect in a small garden. With the final field testing of the monarch habitat quantification tool nearly complete, it will now be reviewed by monarch scientists. This external review process will take place over the next few months, and we expect to have the tool ready for full implementation in spring 2017. The first projects through the exchange will most likely take place in Texas, where we have made great progress with local ranchers who are interested in doing pilot projects. 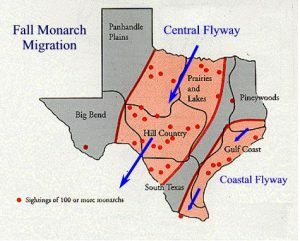 I’m very excited for the future of monarchs in Texas and I’m glad to see my home state taking major steps to create a path forward, both for Texas agriculture and the environment. This entry was posted in ecosystems, Habitat Exchange, Wildlife Protection and tagged cattle, conservation, environmental defense fund, farming, habitat exchange, habitat quantification tool, migration, milkweed, monarch butterfly, ranching, Texas, texas parks and wildlife department, U.S. Fish and Wildlife Service. Bookmark the permalink. Both comments and trackbacks are currently closed.